Procter & Gamble (NYSE: PG) is scheduled to announce its fiscal fourth quarter results on Tuesday, July 31. The company’s revenue and earnings per share came in ahead of market expectations in its fiscal third quarter earnings. 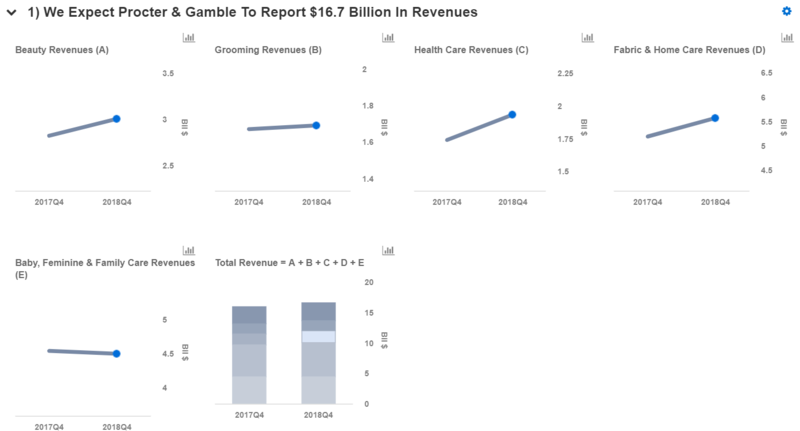 In Q3, the company’s net sales grew 4% year-over-year (y-o-y) to $16.2 billion, driven by growth in the Beauty, Fabric & Health Care segments, partially offset by flattish growth in the Baby and Feminine Care businesses. Overall, the company’s organic sales were up 1% on 2% volume growth, with a 2% decrease in pricing and 1% growth in mix across all segments. In terms of bottom lime, P&G’s core EPS (adjusted) also grew 4% y-o-y to $1.00, primarily driven by increased net sales, partially offset by a reduction in operating margin due to reinvestments and gains on the sale of real estate in the base period. Procter & Gamble’s stock price has declined more than 10% over the course of 2018, due to falling prices and rising cost inflation. Our $83 price estimate for Procter & Gamble’s stock is slightly ahead of the current market price. We have created an Interactive Dashboard for Procter & Gamble which outlines our forecasts for the company’s Q4 results. You can modify our forecasts to see the impact any changes would have on the company’s earnings and valuation. We expect the company’s SG&A costs to be around $4.9 billion in Q4, up 9% year-over-year (y-o-y). This is based on our assumption of growth in productivity savings from the combination of reduced overhead, agency fees, and ad production costs. We also expect the company’s adjusted gross profit margin to decline slightly in Q4, on the back of rising delivery costs. Based on these adjustments, we expect P&G’s adjusted operating income to decline almost 9% y-o-y to about $3.2 billion for Q4 2018. Overall, these adjustments resulted in a more than 10% dip in our adjusted net income forecast for the company, translating into adjusted EPS of $0.93.